And when they restricted Grange to 184-8, optimism increased in the Ferguslie camp. 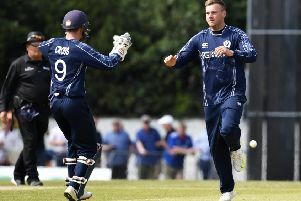 However, Blain had other ideas and the former Scotland, Northants and Yorkshire paceman called on all his vast experience to stifle the normally free-scoring Ferguslie batsmen and turn the game decisively in the Edinburgh team’s favour. Blain said: “I know I got five wickets but the real game-changer was the stand between Foulds and Brock. It wasn’t an easy wicket and it’s a big oval so we knew every run was worth two and the pair of them got their heads down and put us in a good position. The absence of the injured Dylan Budge and unavailable Preston Mommsen clearly left a big hole in the capital side’s middle order but a fifth-wicket stand of 77 between Foulds and Brock brought some respite before Carruthers returned to the attack to remove the former. Skipper Brock went on to top-score with 39 before nicking Hamza Tahir behind, while the Ferguslie attack continued to keep their discipline in restricting their rivals to 184-8 after their 50 overs.